Russia today threatened to sink foreign naval and cargo ships using the most northerly major sea route in the world unless they abide by strict new rules. The Kremlin is demanding 45 days advance notice of voyages and insisting foreign vessels take on board a Russian pilot as they sail through the Arctic. Even then, non-Russian ships may be refused access to the Northern Sea Route. Vessels disobeying the edict could be arrested or sunk, say reports. The move comes amid Moscow’s growing military presence in the Arctic which the Kremlin is also exploiting for oil and gas. The route covers Arctic waters north of the Russian mainland including the entire length of Siberia. It connects the Atlantic to the Pacific. Due to global warming, the route is far more accessible to shipping than a generation ago. The new regime imposed by Moscow was revealed today by Izvestia newspaper. The rules were dressed up as Moscow keeping control of pristine Arctic waters. Yet they were needed due to ‘increased activity of various states in Arctic military naval zone’ as well as to keep control over environment and merchant shipping, said Izvestia. US and other NATO countries have paid special attention to the Northern Sea Route, along which Vladimir Putin is massively boosting the presence of his military machine. It comes at a time when fears of a new Cold War have put diplomatic relations on a knife edge, as Russia continues expanding into the Crimea since a popular uprising in 2014. Furthermore, Vladimir Putin and President Donald Trump decided to quit a landmark Reagan-Gorbachev era nuclear missile pact to keep medium range missiles off the European continent last month. The US accused Russia of developing and deploying a cruise missile that violates provisions of the pact that ban production, testing and deployment of land-based cruise and ballistic missiles with a range of 310 to 3,410 miles. Last year a French RONA naval support vessel passed along the Northern Sea Route without advance warning, say the Russians. The commander of the ship later said that the purpose of the journey was to gather more knowledge about the region. Ships with cruise missiles on board passing along the route pose a serious threat to Russia as they keep virtually all key military and political centres at gunpoint, according to the report. ‘The current international situation demands Russian control over the Northern Sea Route,’ said Alexey Chepa, deputy chairman of the international affairs committee of the Russian parliament. Military expert Vladislav Shurygin said that the new rules are overdue. ‘NATO and the USA can try to create a hotbed of yet more tension next to our borders, and the passing of the French naval ship proves it.’ Notice of foreign naval sailings must include a full description of a military vessel, as well as the military rank and identity of its captain, say Moscow. Vessels breaking the new code could be arrested or destroyed, the Russians are warning. 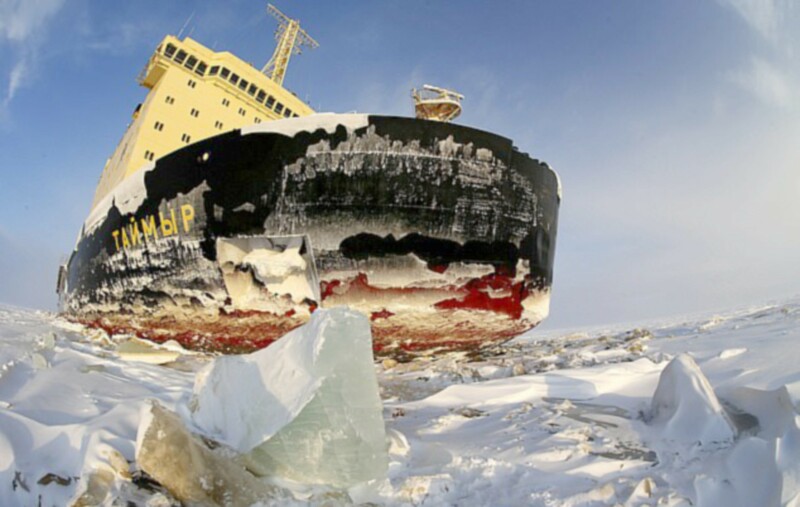 ‘Should the Russian side conclude that a vessel is old, its trim is not suitable to go through ice, or its crew is not properly trained, the ship might be banned from using the Northern Sea Route’, said Professor Kamil Bekyashev, vice president of the Russian Maritime Law Association. Should a vessel proceed without a permit, Russia reserved the right to forcibly stop it or even destroy the ship, he said. ‘International maritime and national legislation allows us to do this, since such a vessel carries a threat to navigation, the environment and human lives,’ he claimed. Western countries have argued that the route should be open to all countries. The latest statement of the kind was made by U.S. Coast Guard Commander Adm. Paul Zukunft in 2018. But Moscow insists the route is within its territorial waters or covered by rules on the protection of frozen seas. The new curbs follow an attempt by Moscow to encourage the use of the route for cargo shipping cutting many days off alternative journeys. The Izvestia story reported: ‘The new rules prescribe that foreign states send a notice regarding the planned travel of their ships along the Northern Sea Route 45 days in advance. ‘The notice must indicate the names of military ships and vessels, their goals, routes, and duration of the voyage. ‘It also must indicate main ship parameters, such as the displacement, the length, the width, the draft, and characteristics of the power unit. ‘It is also necessary to report the military rank and name of the captain. The ships will be compelled to take Russian pilots aboard. ‘Russian icebreakers will lead foreign ships through the ices if necessary.’ The ships will also be compelled to prevent environmental pollution. In case of emergency or complicated ice conditions, the captains must send a report to the nearest Russian port or military base.